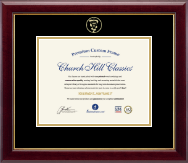 Choose one of our veterinary certificate frames, then customize and make it your own! Whether you’re a veterinarian or a veterinary technician, you’ve devoted your schooling and professional life to the care and safety of animals. Your training never stops, and you have the degrees and credentials to prove it. 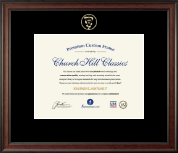 Give your college diploma, licenses, and certifications the respect they deserve by showing them off in handcrafted, veterinary custom frames. 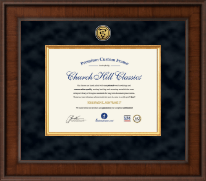 Each museum-quality frame boasts a gold engraved medallion or embossed logo of the official veterinary seal. We’re experts when it comes to custom framing, and veterinary profession logo frames are no exception. Looking for a particular certificate frame size? We’ve got it, and we guarantee you’ll love your document frame! Simply select from our best-selling veterinarian frames for certificates, personalize the look you want with our custom online framing tools, and then order. Our veterinary custom degree frames can be used as award frames, unique picture frames for your office, or as university diploma frames.